So, for hundreds of years, people could relax in the hotsprings of Turkey while fish gently nibbled on their skin. Apparently, it is so hot in these springs that not much can grow, so the fish are quite hungry. In comes a human with dry, flaky skin, and the fish see a feast before them. 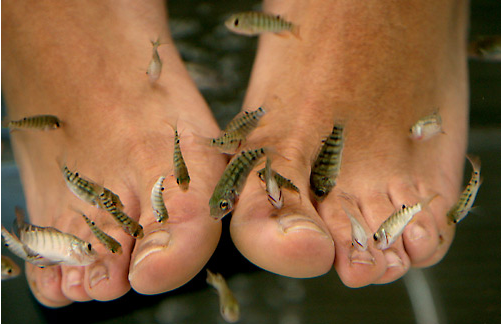 In the 1980's, Turkey began using these "doctor fish" to officially treat skin conditions such as psoriasis and ezcema. In 2008, a salon in Virginia became the first U.S. location to offer the fishy service. Conveniently, these fish prefer affected skin, and will leave healthy skin alone. The fish can be of two different species: Garra rufa and Cyprinion macrostomus. Many scientists think that as the fish remove your dead, scaly skin, light and water can get to the healthy skin underneath, helping your body heal itself. It sounds like a joke, but according to one study published by Oxford University Press, "Ichthyotherapy (therapy with the so-called ‘Doctorfish of Kangal’, Garra rufa) has been shown to be effective in patients with psoriasis in the Kangal hot springs in Turkey." Click here to watch a BBC news report on a fish doctor spa. I believe this is one of the growing trends in health clubs and spa. For some people they find it ticklish, while others find it unacceptable. Well, it's not bad a try just to know how it feels. I usually buy thalgo for my skin care needs but I might just try this one. science + dancing = one cool video!